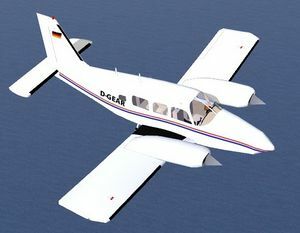 This is a model of a Piper PA34-200T Seneca II. 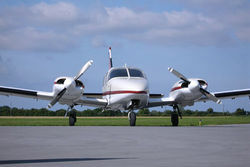 The Seneca has been made by Piper since the early 1970's and some 4500 were made since then. It has six seats in a pretty large cabin, two turbocharged counterrotating engines producing 200hp up to 12,000 ft. It cruises at 170ktas in 12,000ft at 65% power. Certification for flights into known icing conditions and the nice single engine behaviour made the Seneca a popular multi engine trainer. The model was built using the Pilots Operating Handbook, a real Seneca (D-GEJL) and some flight performance data derived in real flights. Using the menu items Help->Start Tutorial a bunch of tutorials are reachable. Cold Start Puts your aircraft into hibernation mode. Everything is off. Hot Start Everything is ready to go, just start the engines and fly. When oat is above zero degc, Ice melts at a rate of 0.5" per 10NM at 10degc, the warmer the faster. The pitot tube is prone to icing, too. 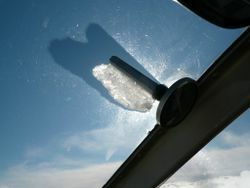 A little agent is waiting for you to get into icing conditions without switching on the pitot heat. If he gets you, he will fail your pitot system which will result in some strange airspeed indicator behaviour. Design Maneuvering Speed (VA) - Do not make full or abrupt control movements above this speed. Maneuvering speed decreases at lighter weight as the effects of aerodynamic forces become more pronounced. Linear interpolation may be used for imtermediate gross weights. maneuvering speed should not be exceeded while operating in rough air. Avoid continuous operation between 2000 and 2000 RPM above 32 IN. HG. manifold pressure. Avoid continuous ground operation between 1700 and 2100 RPM in cross and tail winds over 10 knots. Green Arc (Normal Operating Range) 10 IN. to 40 IN. HG. Red Line (Maximum) 40 IN. HG. Straight line variation between the points given. Datum is 78.4 inches forward of wing leading edge from the inboard edge of the inboard fuel tank. All intentional acrobatic maneuvers (including spins) are prohibited. Avoid abrupt maneuvers. The usable fuel in this aircraft is 61.5 gallons in each wing or a total of 123 gallons. The operating limits for the pressure system are 4.5 to 5.2 inches of mercury for all operations as indicated by the gyro pressure gauge. Flight above 25,000 feet is not approved. Flight up to and including 25,000 feet is approved if equipped with oxygen in accordance with FAR 23.1441 and avionics in accordance with FAR 91 or FAR 135. REMARK: There is a GTX330 transponder as an empty 3d model without functionality. REMARK: There is a GPS155XL GPS as an empty 3d model without functionality. This page was last modified on 24 July 2016, at 13:31.